Two new acoustic shows have been added to the SHOWS page. Check it out! RECORDING FOR A NEW CD! Tony will be going into Earth Tones Recording in Greensbor-, NC to start recording his new album! He's written lots of songs and so has a great selection from which to choose. More news on this as it develops! A brand spanking new acoustic show has been added to the SHOWS page. Check it out! A new acoustic show has been added to the SHOWS page. Check it out! Tony's appearance at this year's International Pop Overthrow festival in Los Angeles on August 6 has been added to the SHOWS page. ANOTHER NEW SINGLE ON THE WAY! This past Monday, August 1 Tony went into Earthtones Recording in Greensboro, NC to record his new song "In My Life." The song will be available soon for download at RuleRadio website. Stay tuned for details on when it's available! In June Tony will be going into the studio to record his new composition "In This Life" as his next single which will be available for download at the RuleRadio website. Stay tuned for details on when it's ready! An upcoming solo acoustic show at The Green Bean has been added to theSHOWS page. Check it out! Tony's got a brand new, just-recorded version of "One Fine Day" available for download at the equally brand new site Rule Radio www.ruleradio.com. Fans of 60's-influenced 12-string folk rock will like this a lot. The download is a very reasonable 99 cents (you can pay by credit card or PayPal)! Check it out! One upcoming solo acoustic show has been added to theSHOWS page. Check it out! Three new full-length demos for songs intended for Tony's upcoming new CD have been added to the DISCOGRAPHY page. Enjoy! Two more upcoming solo acoustic shows have been added to theSHOWS page, including a set at this year's Gate City Ribfest in Greensboro. Check 'em out! IS A NEW ALBUM IN THE WORKS?! Tony will be going into Earthtones Recording in Greensboro, NC to cut some new demos at the end of March. These new songs will eventually be on Tony's next album. Stay tuned for more details as they become available! Three upcoming solo acoustic shows have been added to theSHOWS page. Check 'em out! Tony's playing a full acoustic set the evening of Friday, December 12th at The Green Bean in Greensboro, NC; full information is on the SHOWS page. This year Tony will again play the annual International Pop Overthrow festival in Los Angeles. His appearance will take place the afternoon of Sunday, July 20th; full information is on the SHOWS page. ANOTHER GREAT "SLEIGHT OF HAND" REVIEW ADDED! A very good review by Beverly Paterson for Rock Beat International magazine is now on the REVIEWS page. YET ANOTHER NEW "SLEIGHT OF HAND" REVIEW ADDED! Yet another new (and an excellent one at that!) review of the SLEIGHT OF HAND CD from Orange Entropy Records web site has been added to the REVIEWS page. ANOTHER NEW "SLEIGHT OF HAND" REVIEW ADDED! Another new (and another very good) review of the SLEIGHT OF HAND CD from Aquarian Weekly magazine has been added to the REVIEWS page. A new review of the SLEIGHT OF HAND CD from the current Garage and Beat magazine (Issue #8) has been added to the REVIEWS page. Check it out! UPCOMING ACOUSTIC SHOW IN LOS ANGELES! On the evening of Friday, February 21st, Tony will be playing a career-spanning solo acoustic show at Hallenbeck's General Store in North Hollywood, CA. Click HERE to go directly to the "SHOWS" page for complete info on the show. SLEIGHT OF HAND CD NOW AVAILABLE FROM CD BABY! 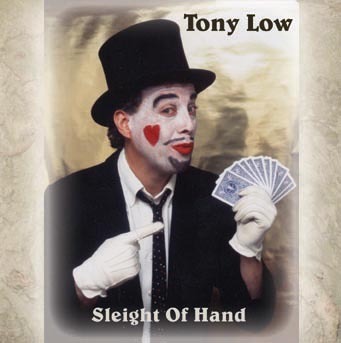 Tony's latest CD SLEIGHT OF HAND is now available for $10.00 from CD Baby; the direct link to the CD is HERE. EXCLUSIVE TONY LOW LIVE CHRISTMAS MP3! On the evening of Thursday, December 19th, Tony opened Wendie Colter's annual Third Thursday Christmas Show at Highland Grounds in Hollywood by playing a live version of The Cheepskates Christmas classic "Christmastime With You" back by Jeffrey Glenn and Joe Kory of The Retros. As a special gift to his fans an mp3 of this performance is available on the DISCOGRAPHY/SOUNDS page. Enjoy, and have a Merry Christmas and Happy New Year! NEW "SLEIGHT OF HAND" REVIEW ADDED! A new (and very good) review of the SLEIGHT OF HAND CD from Leicester Bangs' Christmas 2002 E-Mail Update has been added to the REVIEWS page. DEC 8: INTERNATIONAL POP OVERTHROW SHOW IN BROOKLYN FEATURING TONY ACOUSTIC + A CHEEPSKATES REUNION! As part of this year's New York International Pop Overthrow festival Tony is playing twice at this show - first in a solo acoustic set featuring songs from the SLEIGHT OF HAND CD - copies of which will be available at the show - then in a reunion of his former band THE CHEEPSKATES (featuring main man Shane Faubert)! Full details on this show can be found on the SHOWS page; more information on the International Pop Overthrow festival can be found HERE. SEPT. 27: "SLEIGHT OF HAND" RECORD RELEASE PARTY AT THE KNITTING FACTORY, HOLLYWOOD! To celebrate the release of the new SLEIGHT OF HAND CD Tony is playing a set with a full band at this show. For all the information click HERE. Copies of the CD will be available at the show for $10.00! SEPT. 26: "JUST PLAIN FOLKS" SHOWCASE AT HALLENBECK'S GENERAL STORE! Tony will be playing a short 3-song set as a part of this acoustic showcase featuring several artists. For full information click HERE. SEPT. 21/22: NORTHERN CALIFORNIA TOUR 2002! One live show in Santa Cruz and one radio appearance on a station in Santa Clara. On Saturday, Sept. 21 Tony will be playing a solo acoustic set at the Union Street Coffee House in Santa Cruz. For more information click HERE. And the next day - Sunday, Sept. 22 - Tony will be appearing on the "No Pigeonholes" program hosted by Don Campau on KKUP 91.5 FM Santa Clara doing an acoustic set. The show is on 3:00-5:00 Pacific Daylight Time, and unfortunately the station's streaming webcast is not currently operational, so you'll have to be in the area to hear this one. You can check out their web site is at www.kkup.org. SEPT. 19: NEW SLEIGHT OF HAND CD FINALLY AVAILABLE! It's been a long time in the making, but Tony's new SLEIGHT OF HAND CD is finally available! 12 great songs influenced by 60's folk/rock and garage (and to emphasize that the CD is electronically processed to simulate stereo!). Click HERE to find out more about the CD, and HERE to buy it! We'll be posting more reviews of the CD HERE as they appear.